Many news this month ! - Boat of the year at Le Crouesty exhibition : during the test, the Ostrea 700 has shown all its sea habilities thanks to the bad weather. Testers where impressioned by her seakeeping, quality and strongness. - The last days of the exhbition, while almost all customers trials where cancelled due to bad weather, reliying on its Ostrea 600 and 700 OCQUETEAU could maintain them in good safety and comfort condition. 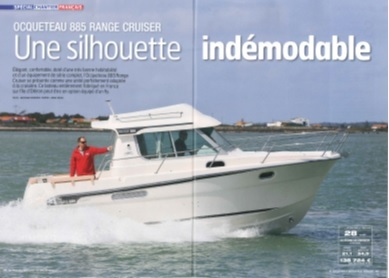 - Article in French Moteur Boat issue "special french shipyard" of this month : Test of Range Cruiser 885, Ré island tour with an Abaco 22 Sun Deck, an interview of Christian Monier sumarized in three questions. - To read also in Hors-Bord Magazine : Ostrea 600 test "a good investment, Ocqueteau's boat being undying", a shipyard brief presentation and a news over the new OCQUETEAU/SNSM (french sea rescue association) partnership. - First press presentation of Ostrea 600 T-Top 200 CV outbord project . - Launch of the new OCQUETEAU/MERCURY partnership. - And rendez-vous in june for a great news !